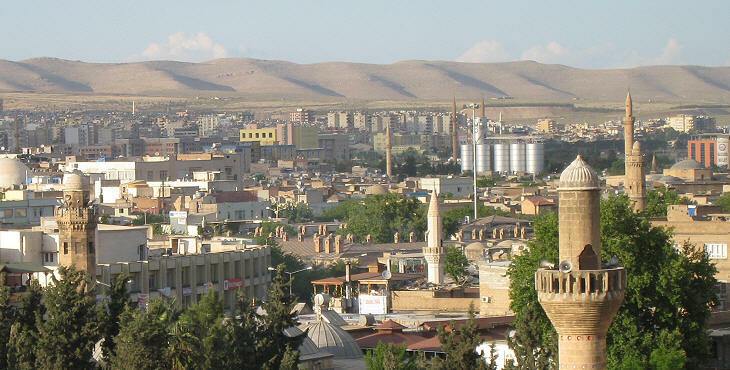 In 1984 the Turkish Parliament awarded the title of Sanli (glorious) to the town of Urfa , for the behaviour of its inhabitants during the Turkish War of Independence. 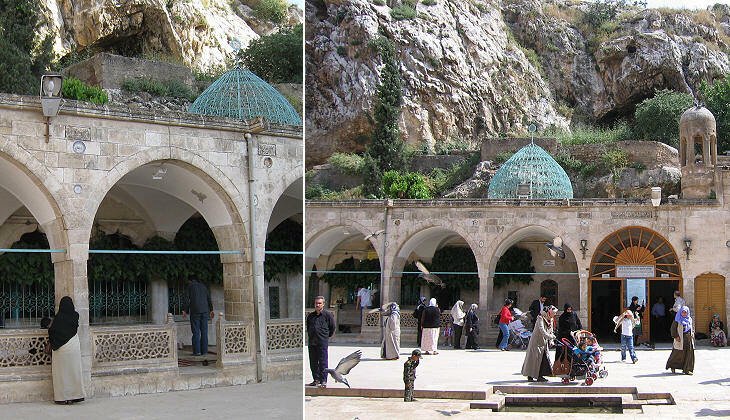 Similar recognitions had already been granted to Gaziantep (formerly Antep) and Kahramanmaras (formerly Maras). 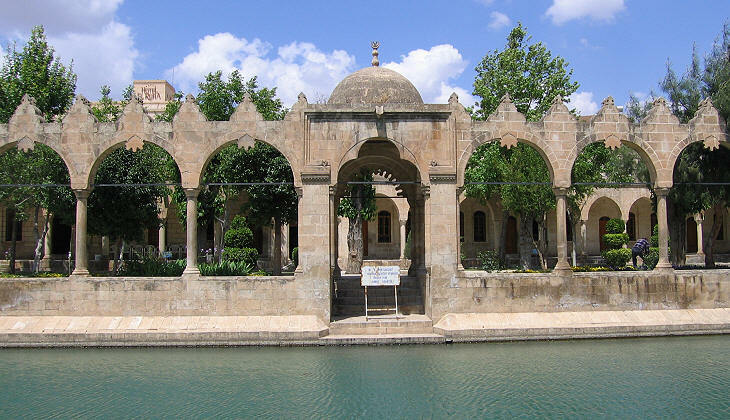 Sanliurfa is located in what today appears to be a very arid region; however in antiquity it is likely that the barren slopes of the hills which surround the town were covered with some vegetation, if not with woods. The recent irrigation projects developed by Turkish authorities have already allowed farming in the plain and they will be followed by reforestation of the hills. The earliest days of the town are set in the XIIth century BC when a rock bordering on a steep cliff was fortified and housed a small settlement. The actual foundation of Urfa is attributed to Seleucus I Nicator, a general of Alexander the Great, who after the death of his leader established a personal (Seleucid) empire over most of western Asia. He named the town Edessa, after the town by the same name in Macedonia, the country he and Alexander came from. 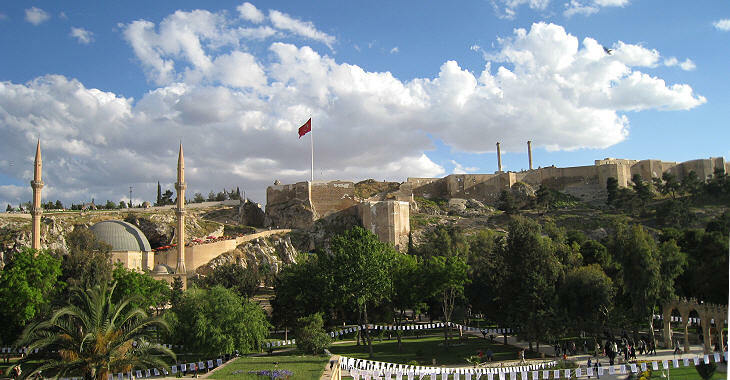 Today the citadel is strictly associated with a Muslim tradition which identifies Urfa with Ur, Abraham's birthplace. 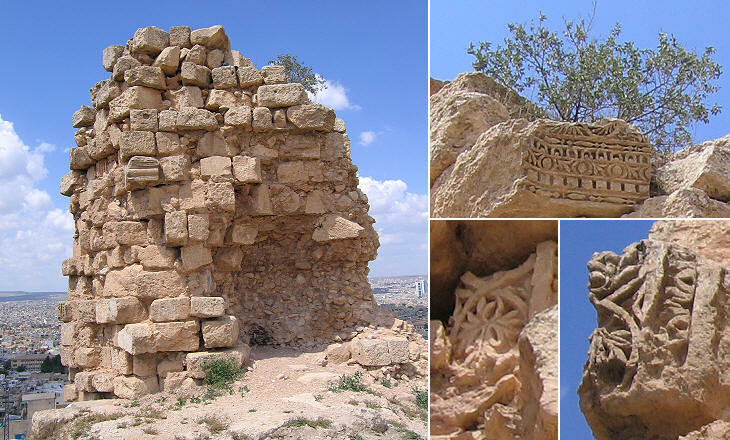 Two gigantic Corinthian columns stand on the cliff; they are called Nimrod's throne, because according to the Muslim tradition, the palace of King Nimrod, the biblical founder of Babylon, was located in the citadel. The columns bear inscriptions in Syriac which lead to believe they were part of a Christian church; Edessa was for a century the capital of a small buffer state between the Roman and the Parthian Empire. It embraced Christianity as early as 201: the local church used Aramaic/Syriac for its ceremonies; a council (not included in the list of ecumenical councils) was held in Edessa in 197. 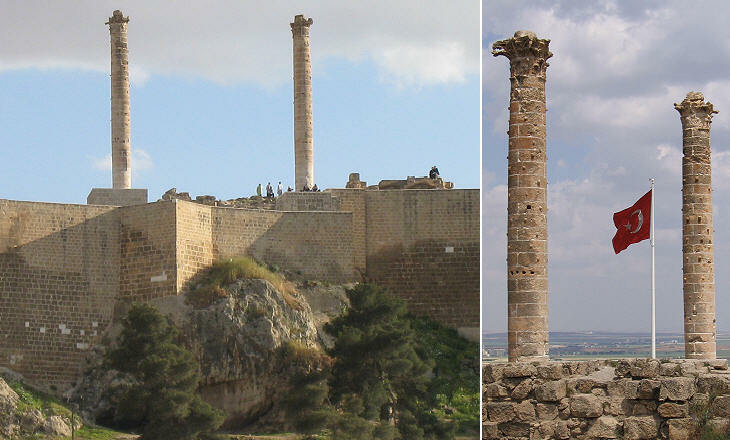 "Nimrod's throne" is a way of saying "The rule of Evil", yet the many military leaders who conquered the town did not order the removal of the columns. Edessa continued to be disputed between two empires (Roman/Byzantine and Parthian/Sassanid) until the VIIth century when it was occupied by the Arabs, who were welcomed by the locals who resented the conflicts among different interpretations of Christianity. 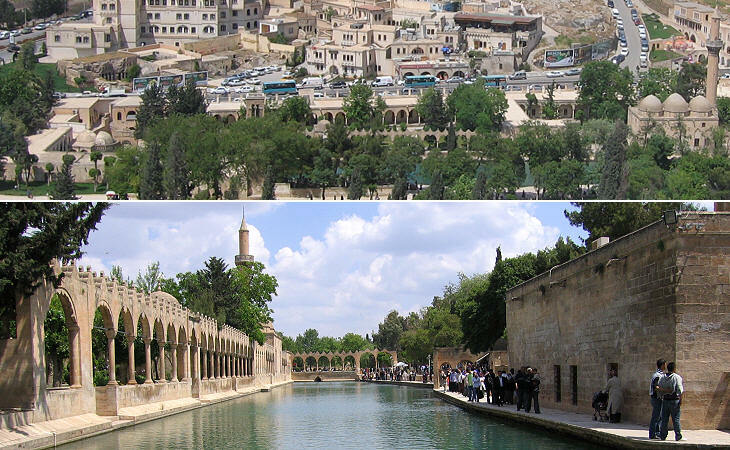 The Arabs called the town Al-Ruha, later named in Turkish Urfa. It was occupied again by the Byzantines in 1030, but their control of the region was weak; in 1098 the Armenians living in the town welcomed Baldwin of Boulogne, a leader of the First Crusade who founded a state known as the County of Edessa. The Crusaders strengthened the fortifications of the citadel; its southern side was deeply dug in order to isolate it completely. The County of Edessa lasted for just fifty years: in 1146 the town fell to the princes of Aleppo; this event led to calling the Second Crusade, which ended in disaster and paved the way for the fall of Jerusalem in 1187. Dergah is a prayer place and the square in front of the cave which is said to be the birthplace of Abraham is always full of believers. The Babylonian King Nimrod had a dream which announced the birth of a child who would be greater than himself. He ordered all babies and pregnant women to be killed. Abraham's mother hid in this cave where she delivered a baby who was suckled by a deer. Abraham spent his first ten years in the cave. Abraham hated polytheism and destroyed idols; for this he was taken to Nimrod who sentenced him to death; a fire was lit on the edge of the citadel, but the soldiers were unable to bring Abraham there. 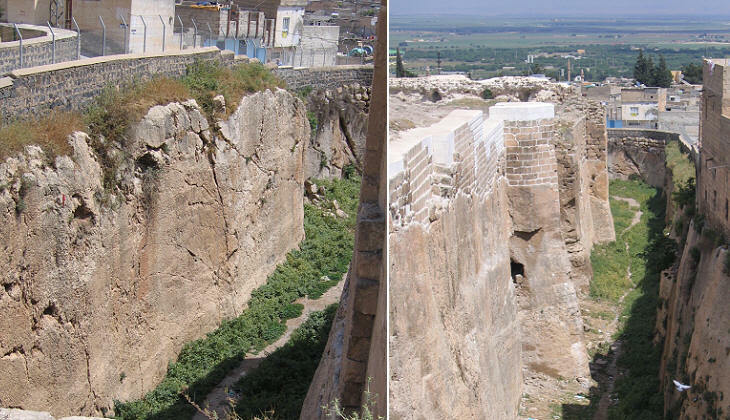 Nimrod ordered that he should be thrown over the cliff, but God created a spring which broke Abraham's fall. Golbasi (by the lakeside) is the name given to a complex of mosques, medreses and gardens surrounding sacred pools, the largest one being Balikli Gol. The cinders of the fire fell into the spring and they were turned into carp; these are regarded as being holy, certainly they are very voracious. 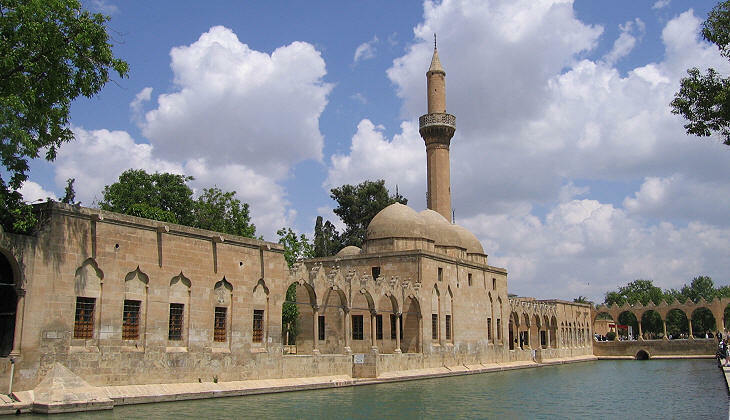 After 1146 the new Muslim rulers started emphasizing the biblical heritage of Urfa. It was a way of bringing together the various religious communities of the town (several Christian churches, Sunni and Shia Muslims and Jews). 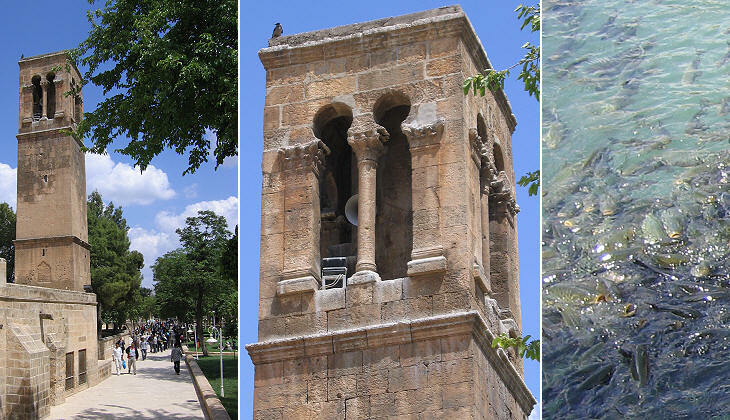 The 1211 minaret of Halil-ur Rahman Camii has the shape of a bell tower; the mosque was built on a previous church and either the minaret is the actual bell tower of that church or it was built following the same pattern. In the XIIIth century the possession of the region was disputed between Mongols and Mamelukes; the latter eventually controlled the region until 1516 when they were defeated by Ottoman Sultan Selim I. Urfa however was for more than a century in the hands of local rulers. The town was not formally annexed to the Ottoman Empire until 1637. Rizvan Ahmet Pacha, an Ottoman governor of the town, built in 1716 a mosque and a medrese on the northern side of Balikli Gol: they constitute a fine example of light Ottoman architecture. 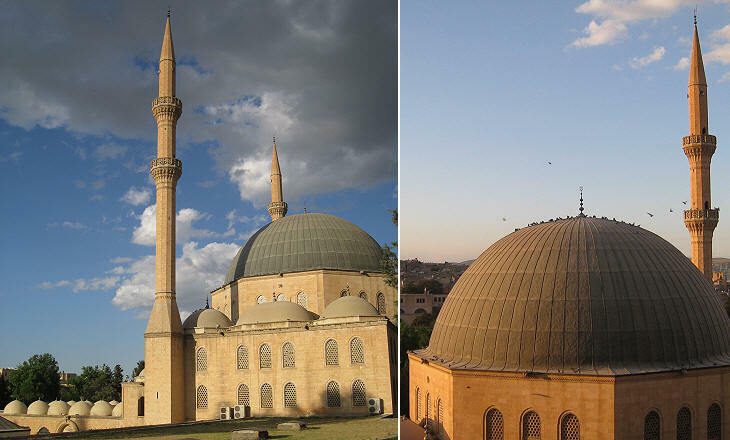 In 1986 a large mosque was built near Abraham's cave; its slender minarets give a more Ottoman appearance to the Golbasi complex, but its size is definitely excessive (see the second image of this page).